Feel like you are walking on pebbles? No foot padding to the heel or ball of your foot? You shouldn’t always feel like you are walking on pebbles! Fat pad restoration at the Foot, Ankle and Leg Vein Center can help you walk easy again. Fat pad restoration is a foot treatment that restores the body’s natural cushioning to the bottom of the foot. This is done in a variety of ways depending on the cause and location of the pain. Dr. Schoenhaus and Dr. Gold offer fat pad restoration in Boca Raton to help you start walking without pain. You spend your entire life on your feet, and that pressure can wear on the cushioning that protects the bones in your feet from the ground you stand on. As you age, your body’s natural fat on the bottom of the foot is lost. This is called fat pad atrophy, and it is common in both men and women. Fat pad atrophy can cause pain on the ball of the foot while you are walking. This is the common cause of discomfort that drives women away from wearing high heels or walking barefoot. Many people attempt to correct the issue by wearing highly cushioned insoles. However, these insoles are often not practical, as they limit footwear choices and do not eliminate the pain while barefoot. Dr. Schoenhaus and Dr. Gold offer fat pad restoration in Boca Raton so that you can walk freely and comfortably again. There are a number of conditions that can accelerate the breakdown of fat pads on the bottom of your feet. When these conditions develop, fat pad atrophy can occur as well. Sometimes, fat pad restoration can aid in the treatment of other foot conditions by enhancing comfort and restoring your ability to move. Burning in the ball of the foot. Feeling like you are walking on pebbles. Bunched up sock feeling under your toes. Atrophy of the fat cushion on the bottom of the ball of foot or the heel is a common condition. In the heel there is an atrophy of the thickness of the fat cushion and is seen with plantar fasciitis. It may be mistaken for plantar fasciitis and your podiatrist in our Boca Raton and Boynton Beach offices can tell the difference. If you have cortisone or steroid injections and the pain is not going away, consider a consultation and fat pad atrophy treatment. There is a loss of shock absorption when you step on the heel. In the ball of the foot there is that pad atrophy or the fat moves under the toes given a bunched up sock feeling in shoes. 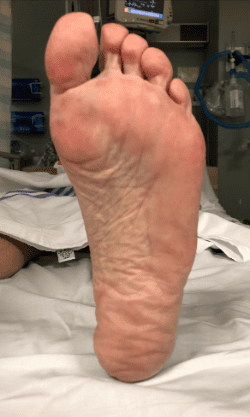 This is seen in people who have a high arch foot. This leads to pain and burning sensations. People often get calluses or corns and areas of skin irritation. The pain makes it difficult to perform activities we like to perform and wear shoes we like to wear. Finally, on the top of the foot you can develop loss of soft tissue fat causing thin skin and you can see the tendons under the skin. Fat pad restoration or enhancement of the fat on the bottom of the foot can be broken down into three categories. Injectable fillers have been used for over 20 years. They are used in dermatology and plastic surgery and are now often used in the foot. This is performed in the office with little down time and is a quick fix for foot pain that can keep you out of surgery. Whether you want to wear high heels or walk barefoot, this treatment is a great option performed by our podiatrist in Boca Raton and Boynton Beach. Currently, we use RADIESSE®, Renuva®, Sculptra®, and JUVÉDERM®Voluma. Walk in and walk out more cushioned! The injections work great on high pressure areas causing corns and calluses. If surgery is needed for other conditions such as a bunion, we will often use a graft and place it into the foot. This is a layered cushion of tissue that is placed under the skin and provides an extra layer of padding. Fat pad transfer or Autolipotransplantation is another fat pad cushion procedure. We work with our plastic surgeons to take your own fat from the stomach or buttocks and it is placed placed into the foot. This procedure can be formed in the office or in an outpatient surgical suite. There is a slightly longer recovery time with the procedure due to the liposuction site and the foot, however you can walk with a special shoe immediately after the procedure. We have found this procedure last the longest and touch ups with stored frozen fat can be injected at a later date. On occasion, we will mix the fat with amnion stem cells or PRP (protein rich plasma) to stimulate the fat and laying down more padding tissue. These techniques offer patients foot pad pain relief and allows them improvement in comfort and shoes as well as activity and ultimately to even walk barefoot. For more information about fat pad restoration in Boca Raton or Boynton Beach, contact us.